Accueil Produits Bande originale La bande originale de “Alamo”. 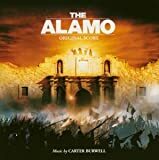 La bande originale de “Alamo”. Sortie : 6 avril 2004. Flesh and Honor – 1:46. 300 Miles of Snow – 0:55. What We’re Defending – 1:48.
Who Took Their Loved Ones – 1:03. Listen to the Mockingbird Sing – 1:15. The Evacuation of Bexar – 1:35. The Calm After the Storm – 1:46. The Visitation of Saint Ursula – 2:23. They Ain’t Bear – 0:54. Sell Our Lives Dearly – 1:35. Night Falls On the Alamo – 1:19. Deguello de Crockett – 1:09. The Last Night – 3:15. The Battle of the Alamo, Pt. 1 – 8:29. The Battle of the Alamo, Pt. 2 – 1:43. The Battle of the Alamo, Pt. 3 – 2:24. The Battle of the Alamo, Pt. 4 – 1:20. The Battle of the Alamo, Pt. 5 – 2:20. The Battle of the Alamo, Pt. 6 – 2:43. The Death of Crockett – 2:18. Blood, or Texas – 3:03.